Q: Otmar, in that very seat yesterday Esteban Ocon was telling us that there’s been a lot of interest in him for 2019. What can you tell us about his future? Otmar SZAFNAUER: Well, I’m glad there’s interest, he’s a great driver and glad we chose him a couple of years ago and have helped him to progress to the point where others are interested. Just happy to say he’s our driver. OS: In truth, we haven’t decided yet. If I was to say this or that, I’d probably be proven wrong. Because that hasn’t been decided. He’s got a contract with us, so for us to… for him to go elsewhere we’d have to agree to that. OS: Sergio, every year about this time we start talking to him about what he wants to do in the future. I don’t think it’s a secret that he goes year-by-year with us but that year-by-year has been five years now. Again, we like Sergio, the combination is great. I know a couple of years ago, maybe even last year, we had some issues but those have been resolved and they work really well together now. And as you can see, they’re very close in the points table, maybe one point apart. I think we’ve got a great driver line-up and long may it continue. Q: Now Otmar, you’ve mentioned the financial constraints your team operates under and Pérez has mentioned it as well just this week. While Force India has always been excellent at performing under such constraints, is the situation now a little bit more critical? OS: We’re used to operating under such constraints. I think the situation’s critical because the midfield’s gotten very competitive. Where last year probably at this time we enjoyed a bit of a gap to our midfield competitors, that doesn’t exist anymore and, depending on what racetrack we go to, some of our competitors are a bit quicker than we are, and at other ones we are a bit quicker than they are. So, it’s going to be a big fight in the midfield. If you have financial constraints – which I believe our constraints are great than some of our midfield competitors – it makes it harder. But we’re here to do the best we can and we’ll continue to push and try to get two points finishes and we’re still focussing on getting fourth again. Q: Mario, there’s a test here at the Hungaroring next week. What’s on the agenda for Pirelli? Mario ISOLA: We are developing our construction for 2019 and also we are planning to test some compounds. I’m talking about the second Toro Rosso car that is dedicated to our tyre testing. Obviously, teams are testing to check their own development. This is useful data for us to understand how our tyres are working. We had a test in Silverstone just after the race with the three cars and we collected quite a lot of data. We were very lucky because the weather conditions in Silverstone were very stable and sunny. So, we ran the test and I believe we have a new product of next year. MI: I’m analysing the document because it is… not complicated but I would say it is different to previous tenders because there are a lot of technical conditions in it. So, we are analysing the numbers that are in the tender. Obviously, we need some time to go that. It’s interesting, with the introduction of 18-inch tyres from 2021 and no more blankets. So, on the technical side, it is a challenge for sure. Toto WOLFF: Before we talk about this race weekend and FP1 session, I don’t want to go just back to business as usual because we are Mercedes and Ferrari are our great friends and at this stage I want to use the opportunity to say that we are feeling with Ferrari and feeling with the family and friends of Sergio and we as well are badly shocked by the events. He was a friend and ally. A great rival and competitor and will be dearly missed. Coming back to the session that you mentioned. It is very early days. Hungary is always very different to all the other tracks. The heat is just kicking in and through the sessions now we need to learn how to set the car up, and understand how the tyres perform and then eventually, hopefully, be ready tomorrow afternoon. TW: The driver contracts were done a long time ago. At least it feels that way within Mercedes. Even though we didn’t have any signature and therefore nothing to announce. It felt that way since the early stages of the season. There weren’t any stumbling blocks to be negotiated, in so far as I don’t think there was any insecurity on the drivers’ side or our side about whether this would come together. Now it’s out in the open, we don’t get the questions any more from you guys – and that makes it a bit easier. Q: I’m going to ask you another question about stability then. You’ve made some senior management changes recently. Why do you feel the need to make then now? TW: Like in any company, you will have a situation where talent grows, develops and eventually comes up and, a few years ago, we identified that we don’t want to create bottlenecks for this upcoming talent and eventually lose them because they don’t see any opportunity any more in the team. The amazing thing we achieved with Aldo [Costa] and Mark Ellis was to identify, mentor and develop that talent. And we had a clear plan with them to eventually put them in positions where they would succeed these great engineers. And that is happening as we speak, over time, over the next 12 months. Mark and Aldo are going to step aside a little bit and this new, young generation of leaders will be coming up. But both of them will stay within the family in roles to be identified – or roles to be discussed in detail. Mark wants to take it a little bit easier. This is a sport that is all-consuming if you give it everything. Aldo wants to spend some time with the family but still be part of the Mercedes family. I’m very proud that we have achieved that transition and were the first team to kind of do that in a structured way. Q: (Jonathan McEvoy – The Daily Mail) To Toto. I was wondering how you see Lewis’ mood. His mindset at the moment. He said this is the hardest race he’s been involved in. I mean this season and the Ferrari rivalry. That a). And b) his remarks about Sky. Would you rather your driver was going home after a race and watching that – or would you expect him to be out celebrating with some mates? TW: The most important is that we give everybody his freedom to organise his time the way he feels, or she feels is right. And be non-judgemental. This is how I try to be within the team. We’re all different. Lewis is a four-time World Champion. He knows pretty well how to extract the maximum performance out of himself and, in so far, I think whatever he does after the race, whatever he feels like doing, is the right thing for him. And, he’s in a good frame of mind. We are all pushing very hard in this championship. The hardest we’ve done in the past because with Red Bull and Ferrari we have two competitors that we recognise as great organisations and in so far, I think his behaviour, the way he deals with it, is very authentic. He wears his heart on the sleeve. He gives you guys great content – because it polarises – and for me this is just fine. Q: (Scott Mitchell – Autosport) Toto, last couple of years Force India has obviously been a good friend for you with Esteban and the opportunity that he’s had there. With the situation that the team’s in at the moment, do you see that as a viable option for next season, even or Esteban or another Mercedes junior in the form of George Russell? TW: We are still very much friends. Otmar walks the dog and comes for breakfast in Oxford, in my place. So… that hasn’t changed. Force India is a team that we aligned with and we have a lot of exchange going on. It has been a great harbour and a great development place for some of the young drivers. They have taken decisions with us that at the time were courageous – like when Esteban was on nobody’s radar, Otmar and his guys took the decision to take him onboard and today everybody wants to have Esteban in the car. They are a good group of racers that punch above their weight. The way Otmar and his team have dealt with their liquidity struggles is amazing. Competing against some of the works teams and we just recognise that. Q: (Dieter Rencken – Racing Lines, Racefans.net) Toto, it’s no secret that Mercedes has nurtured Esteban through his junior career and also holds his contract, in fact he said so yesterday. Under what circumstances would you let him race with a foreign engine? TW: I think that… We have picked Esteban up when Gravity fell apart and the first team that he was actually associated with was Renault. We at the time had just started our junior programme and it just felt right with Pascal and Esteban to give them a go. To date we are trying to set them a path that eventually will make them very successful long term; put then a position to be world champions maybe one day. But with Valtteri and Lewis we have a line-up that is stable, that works for us, and at that stage there is no opportunity within Mercedes and if he has an opportunity somewhere else to be successful as a racing driver and another team or constructor to be successful with Esteban, we wouldn’t want to stand in the way. Q: (Alan Baldwin – Reuters) One of the grievances Lewis seemed to have was that he wasn’t recognised for what he did on Sunday in Hockenheim by the TV commentators. Do you think Lewis gets enough recognition for what he does and what he achieves? TW: Positive headlines don’t sell any newspapers and don’t generate any clicks and I think that he is a polarising sportsman that sells papers. We could talk about philosophy and the digital revolution and the impact on it for a long time but I just think that in the now and here great achievements are never recognised in the way they should be recognised and in five or 10 years we will be looking back and saying we were part of an amazing driver’s journey that will fill books but this is just the way it goes and I think he knows that. Q: (Luis Vasconcelos – Formula Press) For all three, this is the fifth year of these power unit regulations and certainly we are seeing some reliability issues, which is not to be expected at this stage. For Toto, is there is a technical explanation for this? Why are we having more problems, your cars, the Renaults, Ferrari had at the end of last year? For Otmar, in this area is there anything an independent team can do to prevent that, being caught out by that, and for Mario, is this a good change, that people are not criticising tyres or having problems with the tyres and blaming them and they are losing races for other reasons? MI: Interesting question! No, I don’t think so. We try to do our best with the data we receive from the teams and obviously the hybrid power train is working in a different way and we adapt our product to that. I hope that we are not criticised, because we are supplying a good product not because they are having a problem with the power unit. TW: The product is great. TW: We are being pushed by the competition. You’ve said that we are in the fifth year of these engines, which normally is a phase where the development slope flattens out; that would be the logic. Mature regulations, which also guarantee great competition because there are not big gaps between the power units any more. But this season is different. Ferrari has a great power unit and they are setting the benchmark from race to race, they are able to extract more, and this is making us push and obviously making Renault and Honda push and you just reach certain limits. But this fight and the rivalry is the reason why we are in Formula 1. We are trying to be the best ourselves and we recognise that, but this is one of the reasons why you see that we are reaching certain limits by just extracting the last millisecond of performance. OS: My thoughts are that Mercedes have done a great job for us in the last five years; we have had great reliability from them. Your question was did we have an impact on the reliability. All installations are different. We get the power train from them but we have to cool it the way we want to cool it. We’ve got to supply it with fuel the way we want to supply it with fuel and some other things. So we do have an impact on that but predominantly it is the powertrain manufacturer that has an impact on reliability. They do a wonderful job, but as Toto says, we are pushing them now to extract more performance and sometimes that comes at the cost of reliability. It’s no secret that we are struggling on the straights to keep up with Haas and Sauber, so we’ve got to push these guys to gain that advantage back. Q: (Brigitta Gyimesi – Motorsport Mania) Toto, Lewis’ qualifying issue at Hockenheim and the two problems that struck Mercedes in Austria seem to be very similar to each other. Are you concerned that this hydraulics issue might be a recurring problem that could bite you in the coming races? TW: In Formula 1 you are never comfortable with anything, because you’re pushing the boundaries. We have seen similar effects by kerbs but the causes and consequences are totally different. We are on top of it, and we don’t expect any of these problems to come back. The outcome, the consequence of the hydraulic failure was the same but the cause was very different. Q: (Alan Baldwin – Reuters) Otmar going back to what we were saying earlier about the critical situation for the team. Sergio referred to this yesterday. Was he referring to it being critical in sporting terms or critical in more fundamental terms, for the team’s survival financially. There have been reports out there about possibly going into administration. Can you just clarify that? 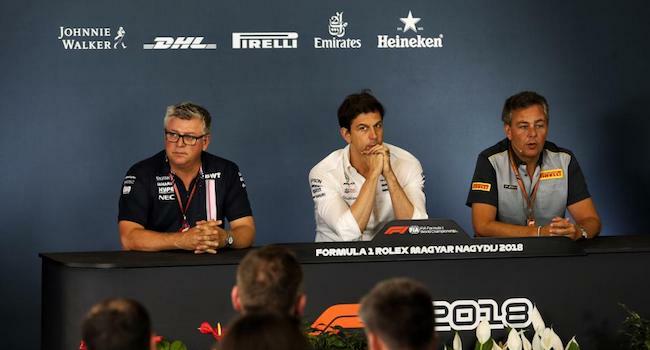 OS: Unfortunately, I don’t know what Checo meant by that, because I haven’t talked to him, but just to answer: there is a high correlation between critical financial situation and the sporting situation. The more money you have in this game, usually the better you do. But hopefully that will be solved soon and we’ll get back to operating in the normal manner that we are used to. We are just in this critical period, which might last a week or two, we have to keep our heads down, do the best we can here, go enjoy, after the test, enjoy our break and then come back fighting thereafter. Q: (Dieter Rencken – Racing Lines, Racefans.net) Otmar, your comments about what Toto’s just said, that they wouldn’t stand in the way of Esteban. Does your tripartite contract allow you release him to Renault? OS: Sure. I mean, we can do whatever we want to do. It’s fine for him to go, but we have to agree to that. I’m sure Toto has persuasive tools, if that’s what we all want to do. We work well together. We had great discussions about Esteban when he came in and if it’s mutually beneficial then of course that’s what we are going to do. We won’t stand in his way. But first and foremost my job is to look after Force India, so I will be pushing to do what’s best for us. Q: (Péter Vámosi – Racingline.hu) Question to all. Yesterday, during the press conference we were talking about a race for team bosses. How do you like the idea. Esteban and Valtteri that you, Toto, could be really good against Christian Horner? OS: Is it team bosses or team bosses’ wives. TW: Then I would be really good. OS: Then Toto would win. TW: If it was between team bosses’ wives I would win. The other thing is I am more ambitious than talented. But I think against Christian maybe it’s still enough. Toto would you welcome such a race? TW: I would be up for it, yeah, immediately. Let’s do that. Q: (Scott Mitchell – Autosport) Otmar, on the Force India situation, how urgently does the team need fresh investment and when do you think that that could be likely? OS: I think it’s imminent. I know there’s discussions going on in the background. I’m not privy to those because it’s a shareholder issue and I’m not a shareholder, otherwise I would know more. But it will be very soon. Q: (Luis Vasconcelos – Formula Press) For the two team bosses: almost every team has a young drivers’ programme and obviously that has helped a lot of talent coming to Formula One, but do you think it’s still possible for somebody who’s not part of any young drivers’ programme from a Formula One team to make it independently to Formula One? OS: We are his (Toto’s) young driver programme. Just kidding. I think it’s been like this for quite some time. You need talent in racing but you also need funding because even at the lower formulas, motor racing is not a cheap sport. So it’s great that Red Bull, Mercedes, Renault, Ferrari all have young driver programmes because they identify that talent and help them through, be it financially or guidance. Is it possible? Definitely. There are some people who come through who aren’t in a young driver programme. Is it likely? Maybe not as likely as it used to be. But it’s definitely possible. TW: I think that the best guys will find us. We are looking at junior formulae, go-karting and if somebody really stands out, then all of us having a junior programme will eventually get in touch. Q: (Dieter Rencken – Racing Lines, Racefans.net) Toto, you’ve got an entrepreneurial nature. It’s probably no exaggeration to state that you’ve probably spent more time in this current role than you’ve spent in any other job in your life before. Could you see yourself taking equity stake in another team like Sauber or Force India, possibly, possibly even alongside your existing role? TW: Thank you for the flowers! No. When I decided to take up the opportunity with Daimler and became a shareholder of the Mercedes F1 team and involved in the management of it, I had to relinquish all positions of potential conflict of interest and I sold my shares in HWA, as you know, and I also sold the shares in Williams and I will not, neither directly or indirectly, be involved in any other Formula One team. Q: (Alan Baldwin – Reuters) Toto, you spoke fondly of Sergio Marchionne at the beginning and obviously Maurizio’s not here to talk about anything but I just wondered… they’ve obviously got a lot on their plate at the moment but when things do settle down, and given your experience and your involvement in negotiations with Formula One about the future, what do you think the main challenges will be for the new man, Camilleri, when he comes in? TW: Sergio was a bigger personality than life, somebody that in the meetings and in the strategy group and in the negotiations with Formula One and FIA had the most powerful voice and these shoes are impossible to fill. With Ferrari, they have a management structure that remains unchanged. Maurizio was very much in charge for running the team and remains our sparring partner in the sport and Maurizio and Mattia and the group somehow are guaranteed that the Formula One team and the operations of the Formula One team is going to continue going forward like it has in the past. For negotiations with F1, Maurizio is also very much up to speed. He was part of most of the discussions, he represents Ferrari in the strategy group so I think it will give the new man coming in a lot of know-how and a lot of information and insofar I think he’s going to be able to catch up pretty quickly but obviously there was only one Sergio Marchionne. Q: (Scott Mitchell – Autosport) Mario, going back to the tyre tender, Michelin have suggested that it’s a problem for them to do one year with 13 inch wheels and then move on to 18 inch wheels after that. Is that a concern for you or would you welcome that flexibility to go with one size and then move to another size in the same cycle? MI: I believe that when you are in Formula One, you can never stop the development so in the statue of the change of size we just change the size, the width of our tyres two years ago and you must be ready to produce any tyre that the sport requires so it’s clearly a challenge, we are interested to apply for the tender. Now the request is to move to 18 inches in 2021, as I said, it’s a big technical challenge but we had many other big technical challenges in the past. If you accept to be here, you accept to put a lot of effort, resources, development and testing in the activity. Q: (Rocio Andreina Romero Navarrete – Motorlat) Mr Szafnauer, how has the team evolved so fast in the last races? What changes have you made? We can see a difference compared to the start of the season to the mid-season results. OS: Well, at the beginning of the year, we weren’t able to put all the developments on the car that we had discovered, so it’s taken us time to get the car to where it needs to be and then once you get the developments on the car, there’s a little bit of learning that happens too to extract the performance out of it. We’ve done that now, so I think we’re at a better place than at the beginning of this season and there’s still more to come. We’re not quite where we want to be, it’s tough in the midfield. We still have to push developments this year. Unfortunately the cars are changing a lot next year. The regulations have changed significantly again so we’ve got to make a decision at some point to stop this year’s development and start on next year’s which will happen soon, but we need to develop to a point where fourth in the championship is still possible but not at the great expense of next year’s car. Q: (Peter Vamosi – Racingline.hu Two weeks ago, at the Slovakia-ring, two popular FIA series, WTCR and the European truck race championship, merged for a race weekend and it was a big success. What do you think? Is it a good idea to make something like that with Formula One also, maybe together with DTM or WEC, whatever? TW: There are other good examples in the past where series have merged. I remember 15 years ago where Mario and I used to play in the Super Racing Weekend and the FIA GT and Endurance format with the European Touring Car championship and with all the Renault single-seater, junior feeder series, Renault two litres, World Series and it was a fantastic place to be, at the track with lots of audience. There were manufacturers engaged in each of the series, therefore lots of guests and hospitality, activities on the track and what you’ve seen in Slovakia-ring is a similar exercise. I think Formula One is bigger than all these series, much bigger than all these series but you mustn’t close your eyes, there could be opportunities out there to invite a series to race with us. MI: I agree with Toto because it’s important to provide the spectators with a good show for all the weekend, not to stay here just for one hour of free practice or qualifying for Formula One and it’s good to have different series joining. Super Racing Weekend was a good example because it was a mix of sprint racing, endurance racing, single-seaters, touring cars which we have in Melbourne, we had the GTs; in Montreal we had the Ferrari Challenge so we already have in the race weekend a lot of support events that are giving the spectators the opportunity to see something different than Formula One. OS: I’m not saying we forget but we should always remember that we do this for the fans so if the fans find it useful to do that then absolutely, we should look at it. Q: (Peter Varkas – Auto Motor) For the team bosses: sometimes it’s crazy to see the rate of the development war between the top teams now. Toto, you had the engine upgrade in France, then in Austria the new aero package, then Ferrari responded at Silverstone with their new aero package, so is it fair to say that the rate of development this year is the highest ever so it’s even higher than before. And Otmar, if that is so, does it make the task for the midfield teams even harder because the top teams are getting all these developments and that makes it hard for the small teams to keep up? OS: I’ve always said and I said it to everybody in our factory, this is a development race, that’s what we’re in and I think Formula One is at the pinnacle of that. We measure our development rate against the top teams, so we know where we start off. Do we develop as quickly as they do, are we falling behind and unfortunately, that’s what Formula One is and we’ve got to be prepared for that and you’ve got to have an organisation that’s prepared for that. You’ve got to have the tools in order to develop faster than your competition and that’s what it’s about. So unless the regulations significantly change, that’s how we go about our business. TW: Yeah, I agree with your assessment. It’s the steepest development rate that we have seen in the last years, on the chassis and on the power unit side.